The text is filled with stories from a criminal life with little concern for the welfare of others. Hassan is involved in fights, robberies, and dealings in stolen goods. He was constantly pulled in and out of institutions and programs, all the while in conflict with family, friends, and well meaning but entirely helpless pedagogues. The narrator does not excuse himself for what he has done, but on the other hand he is so eager to tell, to unveil, that everything seems driven by a desire for confession. I believe this is one of the main reasons for the massive commercial success of YAHYA HASSAN: That it is poetry about life. It is life first and then poetry. The book was written because a particular life was lived, not because a particular plot was invented, not because some good fictional idea was made up in the author’s head. It is authentic, and it is authenticity we readers yearn for these years. But it is not just any old authentic account of a young life that we are presented with in YAHYA HASSAN. Hassan occupies a privileged position qua being who he is. Having been raised Muslim, Hassan is part of a minority that many Europeans have strong opinions about. And when writing from within a criminal Muslim sphere, he provides an access point; he gives rise to a glimpse into a world that the typical reader of poetry is far from being a part of. 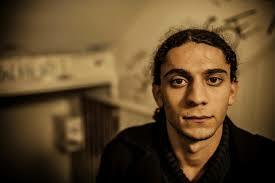 Besides that, it is not the typical reader of poetry who has added up to the massive commercial success of YAHYA HASSAN, there are barely 110.000 typical readers of poetry in Denmark. The typical readers of YAHYA HASSAN are not as interested in how what is being said, as the typical readers of poetry would be, the readers of YAHYA HASSAN are most of all interested in who is saying what in YAHYA HASSAN. And we all love to get our prejudices confirmed; since it means that we were right after all. And we love being right. So the fact that Hassan is implicitly so affirmative about the criticism that is often leveled against Muslim immigrants in Europe, is besides authenticity and readability, a major reason for why everybody in Denmark is suddenly reading poetry (again). And that is the good news.